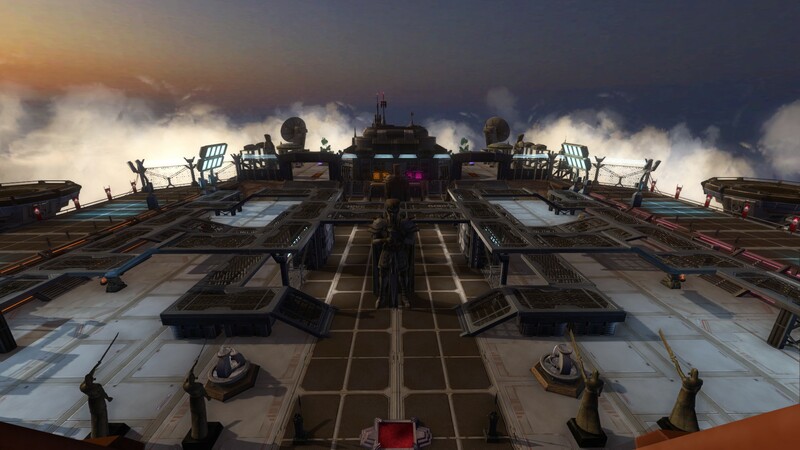 My attentions are currently on a Rishi stronghold, particularly the storm carrier that came with it; I've had the idea of a sort of "mobile academy" mixed with Malagant's usual outdoor garden area with it, added to by the arena on the sky deck. 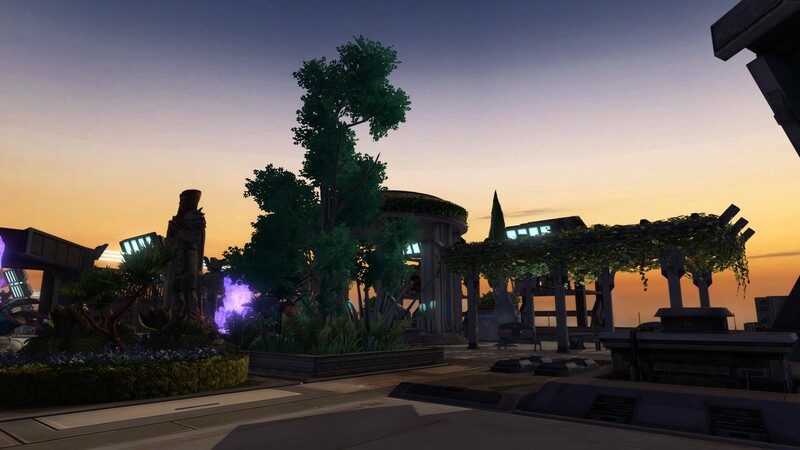 The trouble with reviving the community and the health of SWTOR is that the "doctors" - the developers - are the only ones with the real power to do so, and honestly, their efforts leave a lot to be desired. Speaking for myself, just throwing out one new story (which you can finish in less than an hour) every six months so they can focus on strongholds and the Cartel Market is simply not enough reason to keep coming back. The time it's been out is not a factor; World of Warcraft will be 14 in November, I've been playing that almost continuously (except for about an eight month period back in 2013, but that was personal issues rather than issues with gameplay) since 2005, and I have found it to be far more vital and engaging, especially now that we're three weeks out from expansion #6. Age is no indicator of vitality, either high or low. It also helps that Blizzard has a far less toxic business ethic, far less tainted reputation, and far better track record than EA of late, but I digress. Maybe you're right and I'm being a trifle alarmist, defeatist, or simply lazy and unmotivated. But when the multiverse seems to be passing you by, you don't simply lie down and let it. That's how I feel, at any rate. Part of me is kind of indignant that those of you who have already gone on to the other server have the unmitigated gall to make this suggestion (to which the retort of "you want us there, how about YOU pay for it?" came to mind), but in all honesty, the rest of me feels that it's gotten to the point where nothing BioWare does will matter. Their veteran developers and management people have been bailing for months, and the company has put their reputation (and possibly future existence) on the line with Anthem. I'm going to be even more brutal than Bling: This game is dying. No amount of strongholds or side stories or other distractions can change that. The fact that a mass exodus from a failing server - one of a handful that remain, and one that had to be put on life support by merging it with others - is even being thought of, let alone considered, speaks more to the health of the game itself than it does the community. For years, I've used the example of Warhammer Online: Age of Reckoning, another MMO from a fairly popular IP that was overseen by EA. The number of servers dwindled, and dwindled, and dwindled, until finally, shutdown. The game now exists solely as a private server, and how EA (or Games Workshop) has not gone after them to shut them down after all this time, I have no idea. 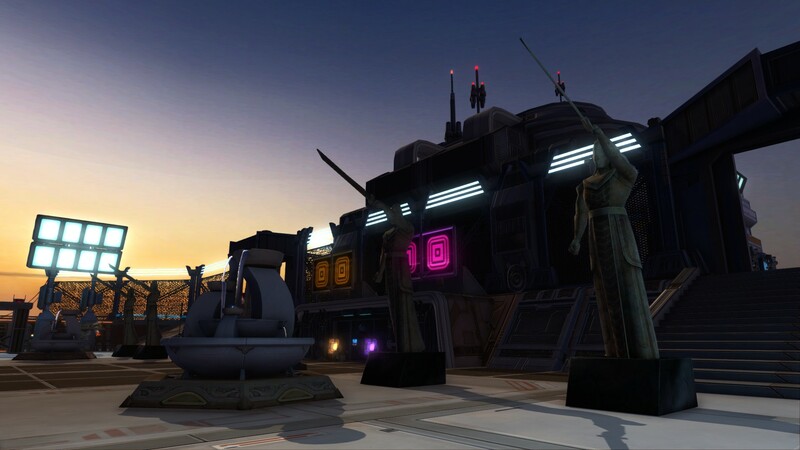 Either this, or utter oblivion, is the future that awaits SWTOR. I have not been here for a long time. I've tried coming back, but the fire has simply gone out. 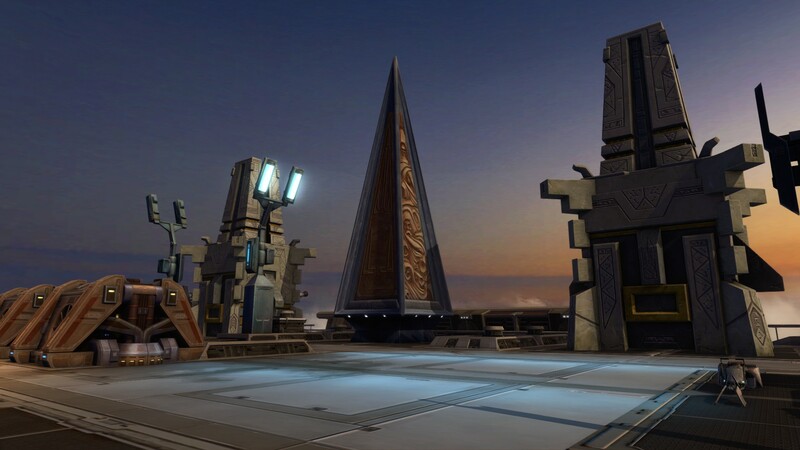 Whether it's here or on Star Forge, there is simply nothing left to bother with. I admit I have not been to Palace in a long time, but it's sad that events have led it to end with a whimper rather than a bang. All this Tea-Drinking Sith Organic (thanks C9) can say is thanks for the memories. Cantina / Re: Roll Call - How active are you? I'm pretty much one of those people who logs into this game only periodically - especially when there's an advancement in the story (and brother, what an advancement Nathema ended up being) - but at the same time, I'm one of those guys who marvels at the fact that the game is still here at all. I've expressed this often enough, and if it sounds defeatist, sorry, but...I'm not going to be surprised when it's not. And no matter BioWare's apparent optimism, I think that will be soon. They should sound -- I don't know. German or Scandinavian, I'd think, with the crisp pronunciation standing in for Cheunh. That would probably work; Lars Mikkelsen, who voiced Grand Admiral Thrawn in "Rebels", is Danish. As for me...hmm, digging through my archives (though I admit I don't play as much as I used to - though maybe this new patch might entice me). Darth Malagant: Bit hard to pin this one down; as Malagant is supposed to physically resemble me, it would stand to reason he'd sound like me as well. Except I'm not British, and can't do accents to save my life. If I had to choose, however - a character based on/named after me was part of a Star Trek RPG, the U.S.S. Excelsior-C, that the guy who played the captain eventually made into an audio series. He made "me" British, a guy by the name of Gareth Bowley. His vocal range is a bit higher than mine, but it works. Admiral Bardin Krysiak (NPC, commands Malagant's fleet): Kevin Whately (Detective Sergeant/Inspector Robert Lewis in the Inspector Morse and Lewis TV series). Moff Arik Daltyn (NPC, military governor of Reydovan Prime): Philip Jackson (Chief Inspector Japp in the Poirot TV series). Captain Eidan Zherron: Louis Ferreira (Colonel Everett Young on Stargate Universe). Master Alieth Taldir: Salli Saffioti (First Arcanist Thalyssra in World of Warcraft, among other things). Ediren Lorath: Brian Bloom (Matt Horner in the StarCraft II games...and coincidentally, the male Trooper in SWTOR). I believe the gloves are from the Hallowed Gothic set. All the pieces for that (except for the helmet) are sold by the reputation vendor on Oricon. The helmet's from a rare spawn, also on Oricon - though I had thought it was from possible rare finds with the Seeker Droid deal from way back when. Cantina / Re: Monthly CM Giveaway! That Sith Recluse lower armor would be lovely. Easiest character to send to would be Nemiya - she's Imperial. I went and saw it just after Christmas, but haven't gotten around to posting on it, so...probably just repeating what others have said, but my take on this whole mix. Rose. I liked her. :D I recall reading something that called her "the new Jar Jar". I did not get that vibe at all. Jar Jar was a chronic screwup (and remember, kids, he helped make the Empire! ), whereas Rose is more of a chronic smartass. And a potential complication for a love shape in the works - because when we started, it was Finn and Rey, then Kylo Ren made it a triangle, and now Rose making it square. Although it could be more triangle-square-pentagon, since some might say it actually started with Finn and Poe...but I digress. Leia's Force trick. Or, as I sarcastically said to my stepfather, "Carrie Poppins". I think that sums it up. And it's sad because Leia is given a HELL of a lot better treatment - a lot more stable family life, for starters (well, except for the kid who turned Sith, Jacen/Darth Caedus, the proto-Kylo) - in the EU, or the "Legends" canon or whatever the hell they're calling it nowadays. I mean, they actually let her have a lightsaber in the EU, for God's sake. She was a Jedi in her own right - as well as on-and-off Chief of State. And at the risk of sounding snobbishly nitpicky, what the hell was up with Leia and Holdo in the fancy dresses when they're supposed to be military types? I mean, granted, it's more "paramilitary" than anything else, but jeez. Even the Rebellion had a sense of military decorum - the flowing outfits were saved for the civilian leadership, like Mon Mothma. And...were we supposed to care about Holdo and the way she went out? I mean, granted, it was cool and all, but...eh. Luke's fate...I'm a bit torn, I'll confess - again, growing up on the EU, I think I kinda got spoiled by the idea of Luke actually being successful in creating a new Jedi Order, even with the bumps in the road along the way. By contrast, the underlying message of TLJ was basically that "failure is always an option", which - though true - seemed to be shoved down our throats here, particularly with Luke. The fact that first Han and then Luke died as broken shadows of their former selves (Luke especially), basically making one last big splash and then being tossed aside, kind of bothers me; it begs the question of "was it all worth it?" 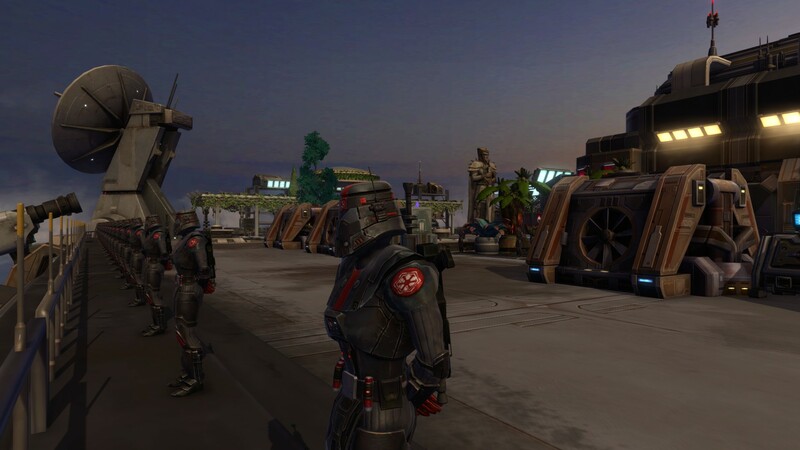 I have long feared and long expected that, even with the Cartel Market as an attempt to bolster it, SWTOR would go the same way as another EA-run MMO based on someone else's IP - Warhammer Online: Age of Reckoning (which is now run as a private server entitled "Return of Reckoning", and is apparently doing better than it was when it was run by EA/Mythic). The exact same deal happened there. Oodles of servers at launch. Then fewer. Then fewer. Then finally one for the western US, one for the eastern US, and one for Europe. Then shutdown. This fear has been reinforced somewhat by the fact that the player character has been shoehorned into the role of the tyrant of the universe (benevolent or otherwise), with only minor recognition of any kind of their prior stories, usually in the form of "oh hi, haven't seen you in a while" when meeting a former class companion. With such power in their hands, how do they go back to just being another Jedi/Sith/spacer/agent/etc.? With WoW, it's not quite as narrow - granted, in-game, you're looked at as the "big damn hero" (especially if you are the outright leader of your class hall, like paladins), but the entire geopolitical setup of Azeroth has not been completely upended by the player character becoming the "big damn hero".